The inspiration to develop a Department of Food Science at UMass Amherst started in January, 1913 when Dr. Frank Waugh, Head of the Department of Horticulture, asked Walter Chenoweth to give a paper on Horticultural Manufactures to a group of fruit growers. Dr. Chenoweth had been hired the year before as a pomologist, and since fruit was a major item for preservation, he was a logical candidate. He answered "But, Prof. Waugh, I know absolutely nothing about that subject". "Fine", said he," then you won't have any prejudices to overcome". That summer, armed with a gas plate and some pots and pans, Chenoweth set up a laboratory in the basement of Wilder Hall. And so it began. The Pomology Department was teaching and demonstrating food preservation. The timing was perfect since World War I pointed out the problem with food shortages. The staff of the College was mobilized to engage in food production and conservation. The effort progressed so well that in by 1917 Waugh petitioned the campus's board of trustees to found the Department of Horticultural Manufactures. 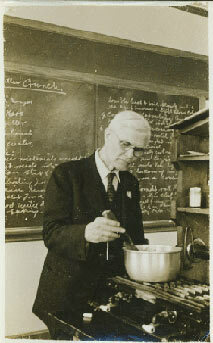 Permission was granted on April 27th, 1918 and on that date the nation's first "food science" department was born. Entrepreneurial thinking and innovation, timing and seizing opportunities, a sense of daring to try something new, recognizing needs and providing solutions, visionary faculty – the qualities that make UMass Amherst Food Science the top program in the nation today were there from the very start. Food Science as a formal academic discipline began at the University of Massachusetts Amherst in 1918, and now, almost a century later, it remains one of the world's preeminent food science programs.